Life Lessons For Mommy – For Your Everday! My daughters been making forts and making tents these days. I don’t know what it is with forts and kids, but we all made them and gosh darnit they were good old fun! It’s always with blankets and pillows and using furniture to hold it all up. And then her little brother comes and godzilla’s it breaking her little heart. She still didn’t ask for a tent just help with building one and making sure her little brother didn’t come and bulldoze it. I would help her make it, and it barely fit both of us and any slight movement always forced it down. She was getting frustrated. And I felt bad. Like iI posted earlier, I did a major overhaul of her toys and now she’s forced to create a more imaginative play time, so I felt like she needed something to pull her space together. I got the idea finally that I should just buy her a tent! A little space of her own that can’t be bulldozed down by a curious little brother. A cute little spot in her room where she can serve tea to her dolly and teddy bear. Or read books, or draw! It really was the perfect idea! When I told her about it, she was ecstatic! So I went on the hunt for a cute little tent! And found out pretty fast that tents for kids are pretty pricey! Really cute one like this are like crazy expensive and didn’t have as much space as the picture looks. And even though I said it was for her, she wanted something my son could play inside too (such a big heart!). So it had to be somewhat gender neutral and big enough for 2 toddlers but also compact enough to fit in a small space. Since they’re kids, they’re going to be rough with it so honestly I didn’t focus on quality too much, just something sturdy and would last a few years. I also found really easy to follow DIY on making a teepee – this one is crazy easy! I might still do this for my son! 1) This awesome tent, that could fit multiple kids, but not tall enough and lets face it this tent is more outdoors not really for a bedroom. 2) This was perfect in size and thought for sure this was the one- but my daughter pointed out it didn’t look like a tent. Finally, I found the right one for my daughter! It looked like a little teepee tent. It was the perfect size for both kids, and tall enough too! And the price was just right. 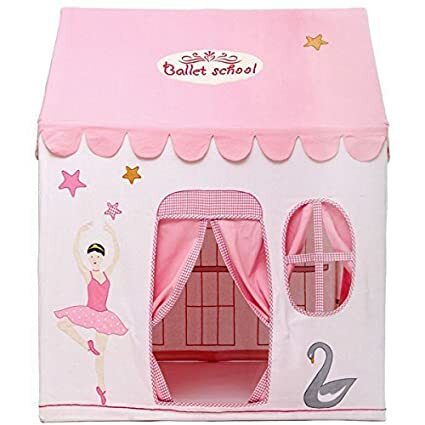 Because come on, it’s a tent, and as much as I want to give her the best of the best, I don’t want to drop her school tuition for the future for a tent today- am I right!? It’s more of a teepee then a tent but it still fit ‘fort like’ theme she wanted. And with tons of options for girls or boys or neutral colours like white. I purchased it and like 3 days it was here! And it’s not that hard to set up! We decided not to buy play balls for it, and decided to keep her space tidy and free of a lot of clutter- she has troubles with clutter. I think the tent makes a nice addition to her room. Only downside is that it’s not foldable or portable, but I know myself, I’m not going to be taking tents to many places so no big deal. I honestly bought the cheapest and best tent I could find on amazon, but you can go through and find the one that’s right for you. Keep in mind though, kids can get rough and it might break so don’t break the bank just for a kids tent. Oh here’s a link to the one I got, it’s right here– it’s really pretty! Neutral and cute for any room! My daughter still does make forts- because lets face it, forts are fun! But with this little tent, its a cozy little spot to make imaginative play even more creative and fun! My daughter is 4 years old and is going to a private Montessori preschool and we recently had a parent/teacher conference. Now before I get into the conference, I want to touch base on what is Montessori. Montessori is a hands on form of learning. It is very well recognized and really gets the children engaged in what they are learning through a series of different toys that are tailored for education-such as math and reading. A famous child going to Montessori right now is Prince George! So that’s a plus! But you really need to learn more about it before deciding if it’s right for your child. And you also should consider that not all Montessori schools are the same, some have more play time, some have less. Some are more tailored to reading some are more for math. If you are interested in the Montessori approach it’s best to talk to the teacher and see the work other students have done; and take your toddler along with you to see how they like it. Trust me, don’t spend the money and DIY it! The process of making it yourself is like craft time and also saves a ton of money! And it does the same thing with the added flexibility of tailoring it to your child. Anyways, continuing on. My daughter goes to a Montessori preschool as I stated, but it is also coupled with drilling on good old fashioned pen and paper. Because life is not all games and play time. I believe that learning should be fun but taken seriously. It’s what will set them up for the rest of their life, it should be something you help create love for! So don’t badger and push them, encourage and engage them! So on to the parent/teacher conference! The teacher asked me if she can be blunt so right away I was nervous. I mean I knew my daughter had focus issues and always just wanted to play instead of sitting down to read with me or practice her numbers, but I was not prepared to hear this. “She is stubborn and distracted”…ouch that hurts. But I had to shake off those feelings and stop myself from becoming defensive and get to the point of why she felt this way. When she showed me my daughters work I could see what she was talking about. My daughter has had some conflicting discipline issues (her grandparents don’t believe in time out or consequences just give her whatever she wants to stop the tantrums- sigh). I thought that might be the cause so I discussed what exactly does my daughter do in class, when and how much does she focus. The teacher was very good at explaining my daughters day, and what is expected of her. And she is progressing but she does not like learning at all…she gravitates to just the play time and often starts to look around and loses focus, even during crafts. She simply just didn’t want to do anything that wasn’t playing with toys, not even drawing. I knew right away, that this is the same things I’m noticing at home. Resistance to even read with me, or draw and do crafts. The teacher asked me about her environment at home to get a sense of why my daughter might be so unfocused and distracted. And as soon as she asked how many toys are available to her I knew that this was probably it. My daughter has a lot of toys, and a lot of it was distracting, non-motivational play…basically zombie play. She did have blocks and lego but she usually made castles and thats it. She also has loads of puzzles but she doesn’t want to do them. She also has dolls, drum set, and just a bunch of other toys way too young for her age. The teacher knew it right away, that maybe she’s unfocused because there is no focused play at home. Everything is everywhere and she has loads of stuff to play with. So I went home and went through all the toys and started to pack up a lot of the stuff she didn’t play with, were too young for her age to play with and just loud distracting colours and sounds….I left her with her puzzles, her books, 1 doll set, her dress up box and her mouse family tree house, and thats it. In 2 days I noticed a difference in her. She started to play with her puzzles, she even sat down and read with me. Like how long has it been since she did that, I can’t even remember! Her attitude also calmed down, she responded better when I told her no or time out. I think she honestly needed a overhaul of her toys and all the things that distracted her. She practiced her numbers with me and was eager to see all the check marks and wanted to correct her work when she got an X – I saw that as a huge improvement instead of her just accepting the x mark and doing nothing about it. So if you have a toddler who is all over the place, try to clean up your house, put away things in drawers or boxes and keep their toys limited and to things that stimulate imaginative play and not zombie play. For example a toy that you just press a button and the lights flash and a voice comes on- even if that voices is for alphabets, that’s zombie play. Get a puzzle instead, or purchase a kids boardgames that gets them excited and thinking. And when you get a doll, don’t just get a frozen doll that all they are going to do with is brush their hair. Get a set, that comes with some accessories like little pets or furniture. It doesn’t have to be pricey! If you don’t want to buy it, grab some dollar store felt material and cardboard and make your own accessories and get their minds going! There are great tips and tricks on pinterest on sensory play, but try to look into creative play because nothing builds a mind better then thinking and problem solving. And get rid of all those toys! !